Built in 1936 as Orlando Stadium, what later became known as the Orlando-Orange County Florida Citrus Bowl Stadium served as the home of the USFL's Orlando Renegades in 1985. 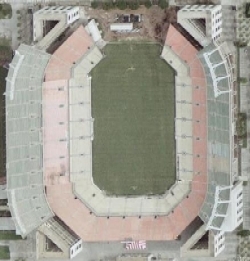 With a seating capacity of over 65,000, the Citrus Bowl later served as the home of two college bowl games (the Florida Citrus Bowl, which was originally known as the Tangerine Bowl; and the Champs Sports Bowl, which was originally the Sunshine Football Classic), as well as the annual game between Florida A&M University and Bethune-Cookman. It had also served as the home stadium for the University of Central Florida, but in 2005 UCF began construction on a new facility. In September 2006, Orlando mayor Buddy Dyer announced a $175 million expansion/renovation project for the stadium as part of a $1 billion-plus "Triple Crown for Downtown" program that would also renovate the Orlando Centroplex and build a new arena for the NBA's Orlando Magic.